Finding foreclosures is easy in depressed markets, but it's also possible in strong real estate markets. You'll find a greater number of foreclosures in falling real estate markets. Sellers stripped the foreclosure home's assets and/or vandalized the property. The bank refused to accept less than its present mortgage balance. Buyers passed over the short sale in favor of a hassle-free purchase. The location of the home and/or neighborhood was undesirable. The listing was overpriced at its mortgaged amount. The seller did not qualify for a short sale. Not every foreclosure is a bargain, and some can morph into unexpected nightmares. There are drawbacks to buying foreclosures. Still, some foreclosed homes are diamonds waiting to be polished. Inexperienced foreclosure buyers might want to hire a real estate agent for guidance and assistance. There are several ways to find foreclosures described below. Agents have direct access to tools that consumers don't, like the Multiple Listing Service (MLS), which they use to share information about properties. You can also ask your buyer's agent to search for REOs, real estate owned by lenders. If you see a listing agent's name over and over, pull up that agent's profile and look at his or her listings. You will probably find a ton of foreclosures at your fingertips. 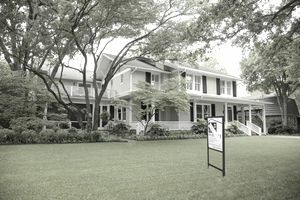 Call the agent whose name is on the sign and inquire about other foreclosure listings that may be coming on the market. Agents who specialize in foreclosures sometimes wait weeks while bank management approves the list price, so you can get a jump on other buyers by asking about new foreclosures not yet listed. If you are working with a buyer's agent, you can ask your agent to obtain this information for you. Many banks maintain online lists of foreclosed properties. Not every bank will sell to individual buyers. A more common practice among the large lenders to dispose of REOs is to bundle them into a package and sell that package at a discount to investors. Some lenders hire an asset management company to handle foreclosures on the lender's behalf. Wells Fargo uses Premiere Asset Services. Keystone Asset Management is a national agency that deals with defaults. Web-based foreclosure companies charge a fee for providing you with a list of foreclosure properties. The reason they charge is because t it takes time, trouble, and expertise to locate and assemble accurate national foreclosure lists. You may find it's worth it to let companies like Foreclosure.com and RealtyTrac search for you. You might also want to try your hand at bidding for a foreclosure on the courthouse steps. Beware that professionals often rule these premises. The downside is you generally are required to pay cash and buy the property sight unseen, and you could be assuming liens or judgments and be forced to pay delinquent property taxes.